Hate them love them but they are quintessential and most often than not help save your camera from a nasty bump. When Canon feels that every L lens that they manufacture must be accompanied with a lens hood, that means that they feel it is important to have one. As a matter of fact it is a personal opinion that they are as essential as your standard one or two stop neutral density filter; never leave home without it. 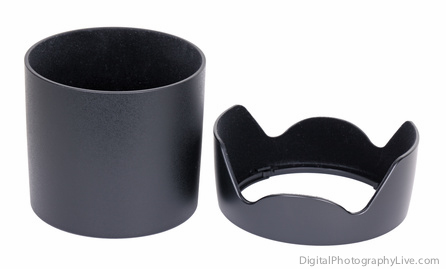 Lens hoods come in different shapes and sizes. There are ones that are specially designed for ultra wide angle lenses which however provide little protection from bumps but do give that little bit of protection against a light source that can create flares. To ensure there are no unwanted flares on the lens is the primary reason for using lens hoods. In fact there are two types of flares one that we can see and the other one that is invisible to the eye, which is responsible for creating unusual skin tones and subdued color saturation resulting in less contrast. For tele lens, specially designed hoods provide more protection from the Sun and of course from possible bumps. Hoods for tele lenses are more pronounced on the far end and they protrude out to prevent the more expensive front lens elements from taking a knock. Lens hoods are normally not designed to provide weather sealing, although they can prevent a little drizzle from smearing the front lens elements. However, if your lens isn’t weather sealed, then it is a bad idea to take it out in the rain! Some lenses such as the Canon EF 16-35 f/2.8L II is weather sealed only when you have a filter screwed on to the front part. If that be the case with your lens, then always carry a filter when you are planning to shoot outside. A lot of photographers who travel quite a lot with their equipment complain that the lens cannot be packed properly in their accompanying pouches with the lens hood on. Here is a tried and tested tip for them. Try screwing on the lens hood backwards and then fit it in the lens pouch. It should fit now and if it does not then you will need a specially designed camera bag to carry your equipment. In any case you will need a special bag to carry your professional equipment when you travel. This will prevent damages to your expensive photography gear. These bags have carefully designed compartments which can hold one to two DSLR bodies, lenses and other accessories. There are some excellent bags available for the same. Speaking of screwing the lens hood in reverse, some people actually do that even when shooting! The basic idea for using a lens hood is so that it can provide protection against the sunlight (or for that matter any other light) from directly falling on the lens. It thus prevents the possibilities of creating lens flare. Lens flare is a problem in most lenses, even the most top end L series lenses from Canon. As such screwing the lens hood reverse when shooting beats common sense. If it is an annoyance, don’t carry it at all.